Being able to easily access and act on data is the first step towards making informed decisions. 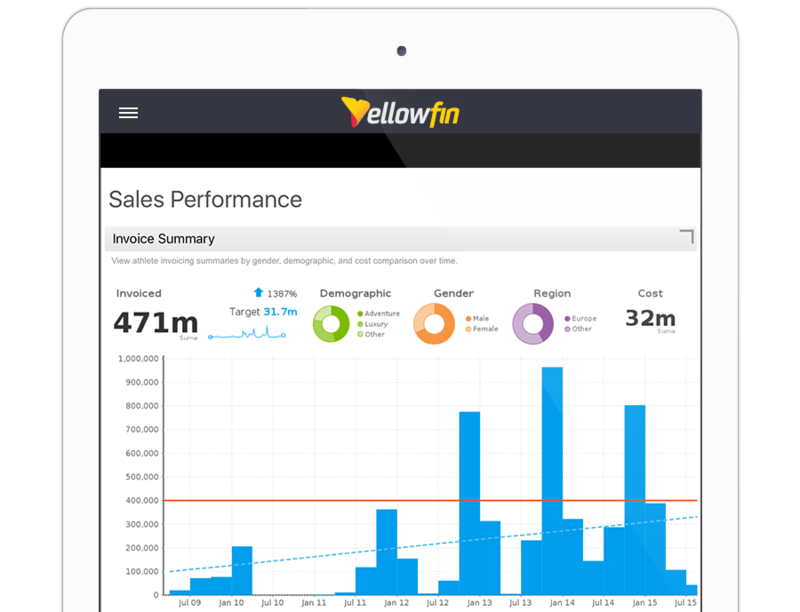 From day one, Yellowfin has been designed to make Business Intelligence easy for you – business users. To meet your needs, we’ve developed a CURATED analytics experience. A governed platform delivers Consistent data you can trust. Intuitive reports and data exploration make insights easily understood and Usable. 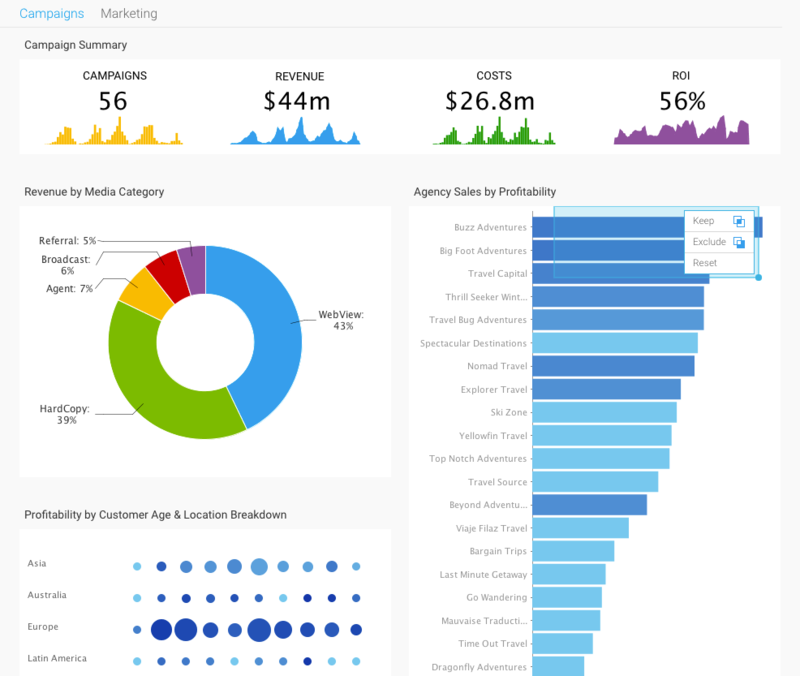 Personalized dashboards, subscriptions and alerts guarantee Relevancy – only receive the data you need, when you need it. A single integrated solution and ability to flag data quality issues protects the Accuracy of your data. Real-time data access, delivery to all mobile devices and embedded analytics on any web-based platform ensures your decision-making is always Timely. Stunning visualizations and industry leading collaboration produce an Engaging experience. Lastly, Yellowfin’s ease-of-use means it can be Deployed throughout your entire organization to support a culture of data-driven decision-making. With Yellowfin, the business user is at the heart of everything we do. Enjoy BI built for you. Ensure your organization is working with a single source of truth. Get control and consistency with the Yellowfin platform in aspects such as roles and functionality permissions and even the data itself. Yellowfin's data layer enables you to reuse business logic and deliver a consistent view of your data, empowering business users and keeping everyone on the same page. The last thing you want is to have spent significant time and money on a BI solution only to discover that business users hardly work with it. That’s why Yellowfin is designed for the consumer. It is interactive and intuitive. Yellowfin's collaboration features work like social media interfaces, so they are instantly familiar. That way, you get great user adoption and return on your investment. Whether it's big data sources, Web APIs or relational database, we do not get in the way of you and your data. 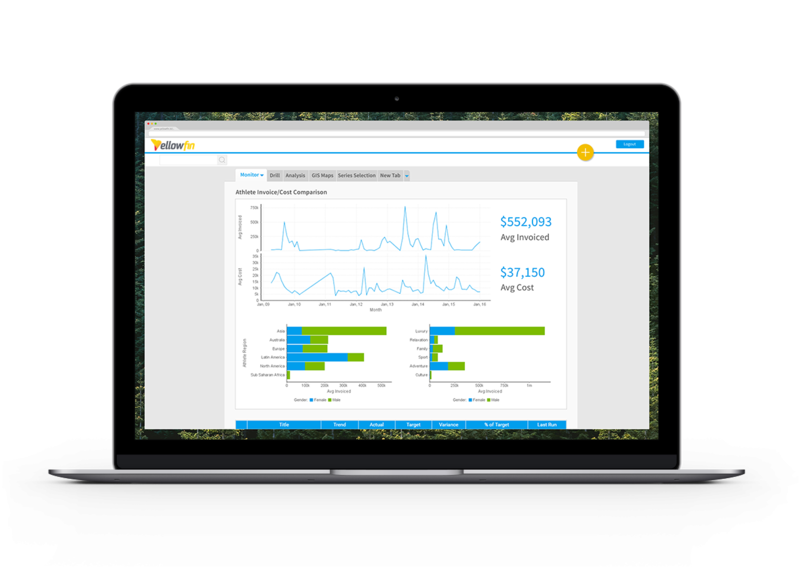 Give business users the right data at the right time with Yellowfin Smart Tasks so they can make the best decisions. Allow users to set up customized triggers based on their unique requirements. Through Yellowfin's unique broadcasts, if data falls outside of their predefined thresholds, a task is instantly created, assigned and given a deadline for completion. 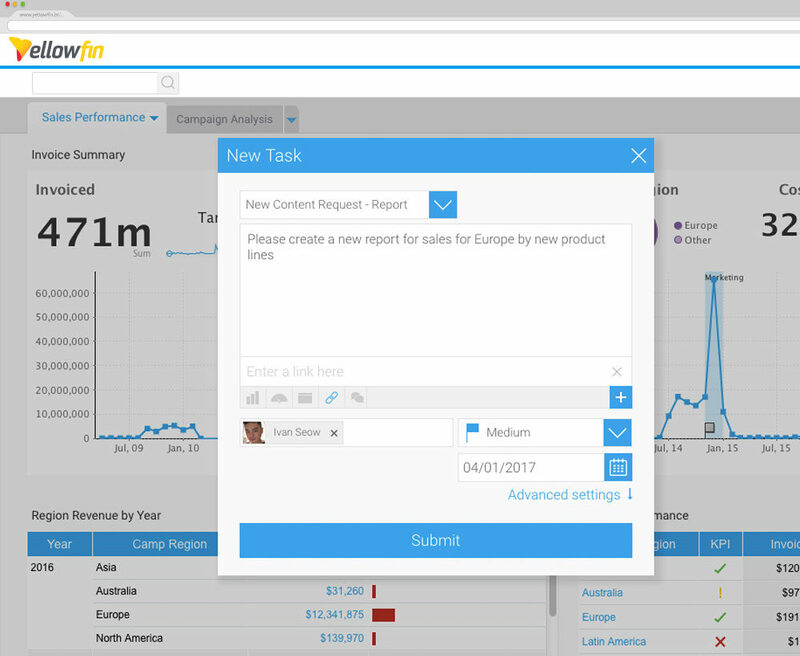 Yellowfin broadcasts and tasks help improve accountability and instantly turn insights into action. The quickest way to lose trust in your business intelligence solution, and have users abandon your platform, is to provide business users with incomplete or wrong data. Yellowfin ensures your data is accurate by letting users notify analysts when data is either missing or incorrect. The ability to create screenshots and annotate where the holes or problems are not only leads to quicker resolutions, but also builds trust in the solution. Yellowfin is a 100% browser-based platform that is easily deployable to anyone in your organization. With Yellowfin Mobile, your business is at your fingertips. Refresh and analyze all your data anywhere, anytime. And, offline mode lets you enjoy uninterrupted access to your data. Yellowfin is available wherever you need it.